The polar vortex is back with a vengeance. Woe… In winter, way up in the arctic stratosphere, something hardly known before is happening. It’s called sudden stratospheric warming where the wintertime upper atmosphere in the Arctic can suddenly warm up by up to 80 C. When something this big happens, it triggers other equally big things. Typical of Earth’s weather, when it warms this much somewhere, an equal amount of cold happens elsewhere. The Swiss Federal Institute of Technology has published an interview with professor Daniela Domeisen that describes what happened last winter that produced such a cold outbreak of the polar vortex. They say it’s too early to say for certain this is what is happening again this year, but their discussion for sudden stratospheric warming causing this year’s polar vortex excursion is compelling. 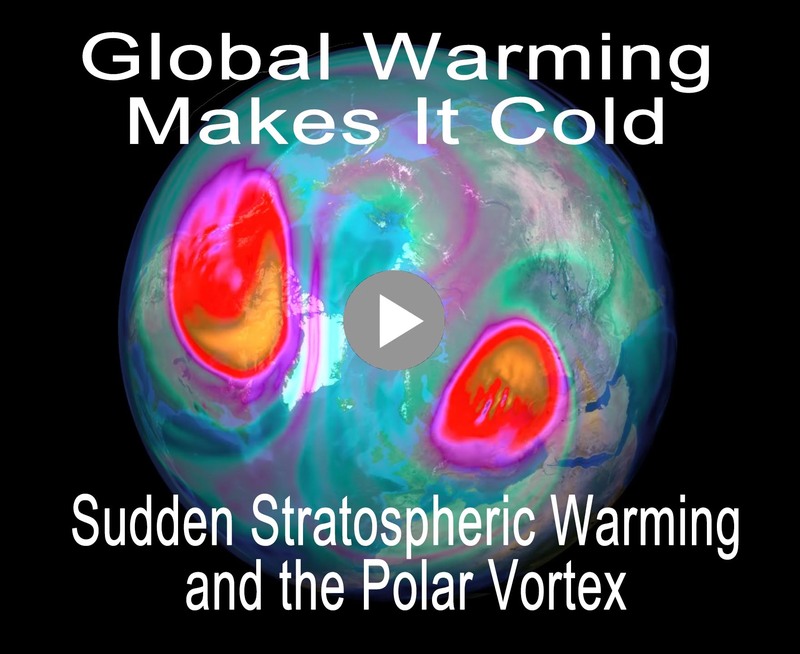 The cover video for this article is a movie of the polar jet stream in the winter of 2017/2018 that produced an excursion of the polar vortex that brought bitter and lasting cold to parts of the US northeast and northern Europe. The polar vortex is a normal winter occurrence. It happens because of winter, allowing cold air to pool at the poles. Because earth spins, this pool of cold air spins too, creating a vortex. An excursion of the polar vortex is what happens when the normal winter pattern collapses for some reason and spills frigid cold out into the more populated parts of our planet. We are not yet absolutely certain why these collapses happen, but we are pretty sure it has to do with an overall weakened polar jet stream, caused by planetary warming, that allows other global weather patterns to become entrained in the normal polar flow. Last winter we experienced what is called a sudden stratospheric warming event that split the normal wintertime polar vortex into two pieces that wandered around the northern latitudes south of the arctic and brought winter back to a warming world. An sudden stratospheric warming event has been observed this year, and when they happen, they cause the normal polar vortex to collapse. In it’s place, multiple smaller vortexes form farther away from the pole, and pull extreme cold weather farther south than normal. The SSW isn’t exactly a sudden warming. It’s a weakening of the normal polar vortex that allows warmer air to flow in from the south. This flow then pushes frigid arctic air further south. In the 1990s, only two were observed. In the 2000’s there were nine. One even happened over the south pole in 2012, something believed not possible. The south pole SSW created a south polar winter where the ozone hole did not form.